Recidivism is one of the most fundamental concepts in criminal justice. It refers to a person’s relapse into criminal behavior, often after the person receives sanctions or undergoes intervention for a previous crime. 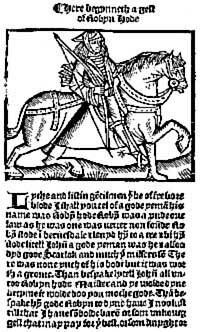 I will talk here again about the ballad A Lytell Geste of Robyn Hode (referred to hereafter as the Geste). It is a poem that was composed c.1450 but not printed until much later, most probably between the years c.1490 and c.1510. It is a long tale composed of eight ‘fyttes,’ and chronicles many of the deeds and exploits that Robin becomes embroiled in. It is a long poem at 1,824 lines. I will dwell here upon fyttes seven and eight in the Geste. Before going further, let me say that Robin Hood is first and foremost a criminal. He’s an outlaw who sets himself up in defiance of the authorities. People seem to forget this. Anything he is taken to represent, such as a love of liberty, or “the fellowship of free and equal men” as some scholars say, are meanings which people ascribe to the legend rather than anything which Robin in the early texts says that he represents. Upon the grounde he lay full styll. The King is also a bit miffed that when he has been hunting, he cannot find any deer, for Robin and his men have been feasting upon them. So the King resolves to travel into the forest in disguise to meet Robin Hood and capture him. Dressed as monks, the king and his men happen to come across Robin and his men. This part of the poem is a rehash of medieval and early-modern ‘King and Commoner’ ballads, and cannot be taken to be factually true. When Robin meets the King (in disguise as a monk) Robin praises the King, and the King is impressed with this. The King forgives Robin for his crimes and invites him to live at Court with him, which Robin readily accepts. He really cannot help himself-once back in the green wood he slays another deer, and immediately sounds his bugle horn and rejoins the other outlaws living in the forest. He remains an outlaw for another 22 years until he finally dies at the hands of the Prioress of Kirklees. 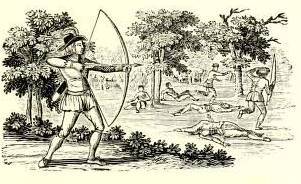 Illustration from Joseph Ritson’s Robin Hood: A Collection of All the Ancient Poems, Songs, and Ballads, Now Extant, Relative to that Celebrated English Outlaw (1795). Now, obviously caution has to be exercised when applying a modern theoretical concept such as recidivism to an early English text, for the legal system of the 1400s was very different to the legal system in England today. But the fundamental principle – that offenders can reoffend – remains the same. To repeat the definition of ‘recidivism’: It refers to a person’s relapse into criminal behavior, often after the person receives sanctions or undergoes intervention for a previous crime. The ‘intervention’ Robin receives is being invited by the King to live at his court. Robin even receives a fee from the king – like a salary – for the duties he carries out at Court. Yet he still cannot help himself but reoffend the moment he is given a little bit of freedom from the King. Were this a more recent outlaw/highwayman from the 1700s, we would term this ‘recidivism’.